FAST descendants of the Danehill male line have done exceptionally well at stud and this bodes well for the future of Rebel Dane. The dual Gr.1 winner, who earned more than $2.4m and was a really tough and consistent customer, will stand at Swettenham Stud in Victoria in the new season on a fee of $12,500. A horse who won every season he raced, from age three to age seven, he defeated some of our best sprinters while in the care of Gary Portelli. 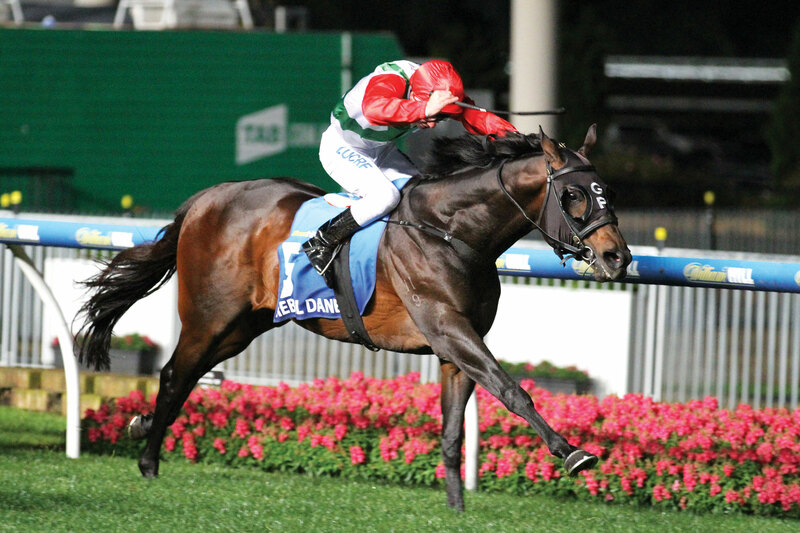 Rebel Dane won eight races including the MVRC Manikato Stakes-Gr.1 (1200m) and MRC Invitation Stakes-Gr.1 (1400m), was runner-up in the T.J. Smith-Gr.1 (1200m to Lankan Rupee), third in the Manikato Stakes-Gr.1 (1200m to Chautauqua) and five-times fourth in Gr.1 events, testament to his talent. His sire, California Dane, was a very fast son of Danehill (USA) who won to Gr.2 level and his multiple-winning dam Texarcana is by Gr.1-winning sprinter More Than Ready (USA), an outstanding international sire whose best locally include Golden Slipper winners Sebring (sire) and Phelan Ready, and now making a mark as a broodmare sire. Bred by Laurel Oak Bloodstock’s Texarcana Syndicate and raced by a syndicate put together by Laurel Oak’s Louis and Jill Mihalyka, Rebel Dane is a descendant of Georgian Gold, one of the first horses syndicated by the company when it was formed in 1986 and their first winner. Runner-up in a barrier trial in the June of his juvenile season, Rebel Dane was back at the track for a trial second on September 14, 2012 before stepping out in a Canterbury maiden (1250m) on September 26, beating Knight Exemplar. He had two more starts in his first campaign and won them both, by 2.25 lengths from Complicate over 1400m at Rosehill on October 13 and then at the same track over 1300m on October 27. Trial wins in January and February 2013 tuned him up for his first black type test in the Royal Sovereign Stakes-Gr.2 (1200m) at Rosehill on February 16 and he passed with flying colours on the dead track, beating Urquidez. He struck a heavy (9) track next time out in the Hobartville Stakes-Gr.2 (1400m) on March 2 and was beaten “a lip” by champion Pierro, with Proisir third. The 1600m of the Randwick Guineas-Gr.1, run that year at Warwick Farm, probably was a shade outside the colt’s comfort zone, but again he was not disgraced when fourth of 11 behind Dundeel, Proisir and Tatra on March 16. He was then unplaced in an end of campaign run in the George Ryder-Gr.1 (1500m) won by Pierro. Back at the track at four on August 24, 2013, he scored a strong win in the Show County-Gr.3 (1200m in 1:09.53) at Warwick Farm, with 1.25 lengths to spare over Title (Norzita third), was then a close fourth in the VRC Bobbie Lewis-Gr.3 (1200m) behind Speediness, Temple of Boom and Albrecht at his first look at the Flemington straight on September 7 and that set him up for a short half-head win next time out in the MRC Invitation (Sir Rupert Clarke) Stakes-Gr.1, beating Fontelina and Solzhenitsyn in 1:23.88 for the 1400m with Glen Boss on board. A close fifth in the Manikato-Gr.1 behind Buffering and a seventh of 13 in the VRC Sprint Classic-Gr.1, again to Buffering, in late October and early November ended his campaign and he didn’t appear until the following April 12 when beaten two lengths by champion sprinter Lankan Rupee (Buffering third) in the T.J. Smith-Gr.1 at Randwick. This was followed by a fifth in the All-Aged-Gr.1 on April 26, a close fourth in the Doomben 10,000-Gr.1 to Spirit of Boom on May 24 and then a seventh in the Stradbroke-Gr.1 on June 7, 2014. Freshened, he was third in the Missile-Gr.2 to Sweet Idea at Randwick on August 9 in what was to be the first in a series of narrow misses, as he was third again in the Moir-Gr.1 to Buffering and Lankan Rupee and then fourth in the Manikato-Gr.1 to Lankan Rupee. He was then seventh in the Darley Classic-Gr.1 on November 8. Sixth first up in the William Reid Stakes-Gr.1 on March 27, 2015, he was then unplaced in the All-Aged-Gr.1 on April 18. Rebel Dane resumed on September 19 with a win over Ball of Muscle and Shiraz in the ATC The Shorts-Gr.2 (1000m) at Randwick on a soft (7) track. Then the runner-up’s half-brother Terravista got his revenge, beating Rebel Dane narrowly in the Premiere Stakes-Gr.2 (1200m in 1:09.10) at the same track on October 3. He was beaten two lengths when third to Chautauqua in the MVRC Manikato-Gr.1 on October 23. First up on January 23, 2016 he was a close third to Holler in the MVRC Australia Stakes-Gr.2 and then fifth in the C.F. Orr-Gr.1, fourth in the Futurity-Gr.1 on February 27 and then unplaced in The Galaxy-Gr.1 and T.J. Smith-Gr.1 before a fourth to English in the All-Aged-Gr.1 on April 16. Rebel Dane’s final season of racing started on August 6, 2016 with a half-length second in the Missile-Gr.2 to Tycoon Tara, followed by a third in the Warwick Stakes-Gr.2 to Winx and unplaced runs in the Theo Marks-Gr.2 and Premiere-Gr.2 before his win in the $1m MVRC Manikato-Gr.1 (1200m), beating Fell Swoop and Japonisme on a track rated soft (5). It was the seven year-old’s fourth attempt in the Manikato following a fifth, fourth and third and Ben Melham settled the entire in sixth before the pair powered along the inside in the straight to beat Fell Swoop by a head. Chatauqua and Buffering were both unplaced and the latter, a seven-time Gr.1 winner, was retired after the event. Unplaced in four further runs in late 2016 and between March and May this year, Rebel Dane was retired with eight wins, four seconds, five thirds and six fourths in 40 starts for earnings of $2,427,350. He earned World Thoroughbred rankings of 115 (2013), 116 (2014), 115 (2015) and 116 (2016). His sire California Dane (Danehill (USA)-Storminwinter (USA) by Seattle Slew) won six races including the Moir Stakes-Gr.2 (1000m) and the Stanley Wootton Stakes-Gr.2 (1200m), both at Moonee Valley and he set the 1200m track record there of 1:09.67 in winning the Damien Oliver Handicap. He entered stud in 2007 and has sired the winners of close to $10m including dual Gr.1 winner Rebel Dane, NZ Bloodstock Filly of the Year Platinum Witness (St Petersburg), winner of the NZ 1000 Guineas-Gr.1, multiple Gr.2 winner Éclair Choice (Woodman) and Listed winners the Monstar (Brocco), Lake Sententia (Aliocha) and Fire Thunderbolt (King Ivor) plus stakes placed runners out of daughters on Integra, Catrail, Dehere, Snippets and Jetball. Many of his best winners feature lines of Sir Tristram or his sire Sir Ivor and he’s also worked well with the Mr. Prospector line, with Star Kingdom, with Brocco (seven named foals for six winners) and with Lunchtime. A son of nine-times Champion Australian Sire Danehill (Danzig-Razyana by His Majesty), his dam is by US Horse of the Year and Triple Crown winner Seattle Slew, a champion sire and broodmare sire in the US. Storminwinter won in Hong Kong and is a sister to Gr.2 winner and Gr.1 placed sire Williamstown and they are from the Irish winner Winter Sparkle (Northjet). Next dam Turn to Talent (Turn-to-Hidden Talent by Dark Star) produced nine winners including stakes winner Hay Patcher, dam of four-time Gr.1 winner and 1994 Champion US Sire Broad Brush (Ack Ack). Hidden Talent is also second dam of the Breeders’ Cup Juvenile-Gr.1 winner and sire Capote (Seattle Slew). As mentioned earlier Rebel Dane’s female line is a special one for Louis Mihalyka as his third dam Georgian Gold provided Laurel Oak with its first winner when successful at Hawkesbury in 1987. The daughter of the Biscay horse Blue and Gold and the Beau Brummel (USA) mare Georgian Knot was selected by Jenny Churchill at the 1986 Dubbo Sale conducted by Peter Milling. Jenny had first hand knowledge of the yearling as she was on foal watch at Hunter White’s Havilah Stud when the youngster was born and she was also keen on the pedigree. Sunday Belle produced the Tasmanian Derby winner Arctic Beau (Arctic Explorer (GB)) and her sister Sunday Best produced the VRC Standish Handicap winner Top Court (Talisman II (GB)). Sunday Belle also produced the stakes placed Tina Louise (Orgoglio (GB)), dam of the stakes winners Lido Girl and Advert. Tina Louise would become second dam of Flight Stakes-Gr.2 winner Allez Show (second dam of Gr.1 winner Z’Oro) and the Gr.1 winner and sire Rancho Ruler. This is the family of The Big Chill, Distinctly Secret, Welkom Gold and Countess Caboul. This is a distinguished family (2g) and Rebel Dane’s 12th dam Amphora (Amphion) won the Gimcrack Stakes and Steward’s Cup in England in the 1890s and is a daughter of Sierra (Springfield), whose brother Sainfoin (sire of Triple Crown winner and sire Rock Sand) won the 1890 English Derby. Amphora’s brother, noted speed sire Sundridge, won the July Cup three times and another brother Elmstead won the Steward’s Cup. Amphora’s daughter Flaming Vixen (Flying Fox) is the second dam of Sword Play and she established a branch of the family whose notable members include My Swallow (dam sire of Commands and Danewin) and Cox Plate winner Dane Ripper. This proved a lucky move as the mare produced Rebel Dane in her first season at stud, visiting California Dane in his second season. Now dam of two winners, she was covered by Hinchinbrook in 2016. More Than Ready (Southern Halo-Woodman’s Girl by Woodman) has been a great servant for Vinery, leaving more than 1500 winners of $177m worldwide and his 170SW also include More Joyous (Sunday Silence), Samaready (Secret Savings), Verrazano (Giant’s Causeway), Prized Icon (Danehill) and Perfect Reflection (Bluebird). For those wanting to double Danehill, daughters of sons of Exceed and Excel (whose dam is by Seattle Slew’s half-brother Lomond) like Victorian-based Reward for Effort or Helmet, as well as daughters of Choisir, could suit Rebel Dane. Daughters of Kenmare and his sons Kenvain and Keltrice also look ideal, as do daughters of Marauding, Lonhro and Spinning World.